We are committed to giving our patients and clients up-to-date, compassionate and professional veterinary care. Our experienced team of 6 vets and 5 nurses are keen to help you make the best prevention and treatment decisions for your animals. As part of the local communities of the NorthWest we can be relied on to give veterinary advice and assistance whenever you need it. Covering such a vast area of North West NSW, we try our hardest to fit work in on adjacent properties and districts to decrease your travel costs. We offer 24/7 after hours emergency service from our hospital in Coonamble. Let us care for your pets, horses and livestock. We offer pet grooming and boarding too! In 2002 a young vet couple took the plunge into business and purchased Coonamble Veterinary Surgery, which was at the time a one vet practice in a very small clinic. 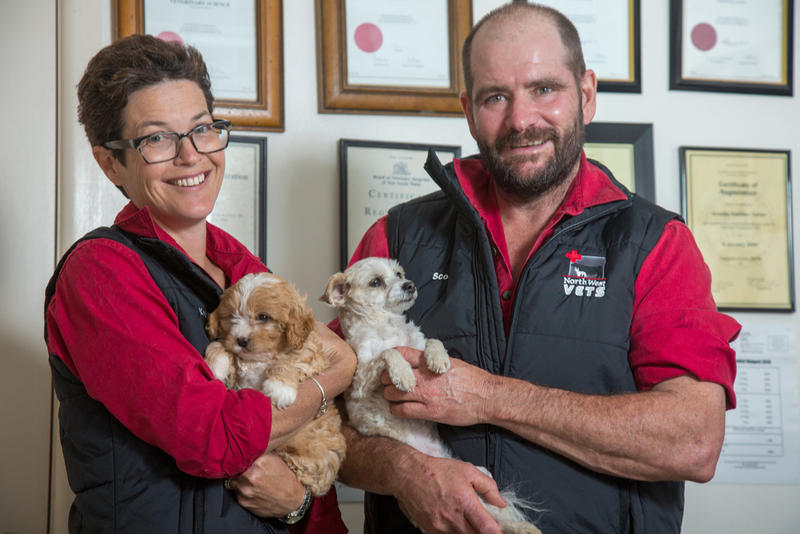 From these humble beginnings, Scott and Kylie Parry have overseen and nurtured the growth of NorthWest Vets to the bustling six vet, three site practice it is today. They have always aimed to provide excellent veterinary care to the pets of the north west as well as a high level of technical expertise and advice to the many pastoral livestock operations they service across the region. In 2015, the business changed names to the current NorthWest Vets, coinciding with the opening of our Walgett branch practice. This was followed in early 2017 with the opening of a branch practice in the opal mining community of Lightning Ridge. These days Scott and Kylie are still very involved in the day to day veterinary work of the practice. But with the addition of four vets and two extra clinics to the NorthWest Vets brand, they now spend more time looking after clients, staff and the business itself. NorthWest Vets aim to provide a high and constantly improving level of service to their small and large animal clients. Both Scott and Kylie are passionate about contributing to their local community, their profession and the industries they service. NorthWest Vets is your friendly and experienced local vets in Coonamble, Walgett and Lightning Ridge. Come and meet our experienced team of 6 vets and 5 nurses, we look forward to seeing you and your animals at your next appointment!